Clean Burning, High Octane Fuel. If you’re at this site, chances are you have heard of E85 that is becoming more and more available at gas stations around the country. This high octane ethanol based mixture cost the same or less than regular unleaded and makes a GREAT alternative to both high priced race gas and extremely corrosive methanol. The reason I know this is because we have been burning it in our blown carbureted small-block Chevy powered 1952 Henry J (right) for the past six years with OUTSTANDING results. This site is dedicated to those who are already running or are seriously considering switching to this renewable fuel source to power their hot rods now and into the future. 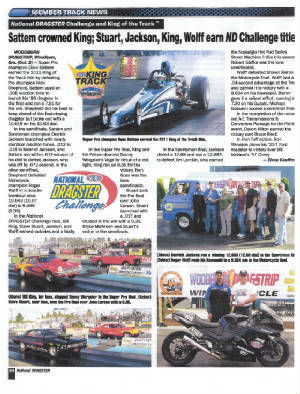 Special thanks go out to Mark Thomas and the Ethanol Performs Funny Car team for the inspiration and Car Craft magazine for the technical information to get us started. Q: Why should I switch to E85? A: E85 is a renewable fuel source that is also environmentally friendly. Its performance is comparable to race gas at a fraction of the cost. Your engine will run cooler and your ETs will be less affected by atmospheric changes. E85 is not corrosive like methanol and does not leave carbon deposits like gas so maintenance is reduced across the board. With the proper tune-up your oil stays looking like new. 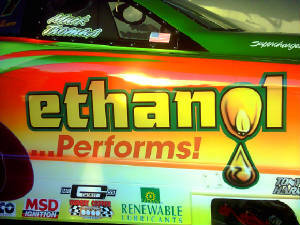 Q: What is the difference in ethanol and methanol? A: Both fuels have an excellent intake air charge cooling effect. Ethanol (grain or ethyl alcohol) is a biofuel made through the distillation of renewable resources like corn, sugar cane and switch grass. Yes, this is the same process they use to make alcoholic beverages like liquor. Fuel ethanol is 180 proof when produced. 15% regular 87 octane gasoline is added to E100 to add a little lubricant as well as ease the initial cold startup. Methanol (wood alcohol) is produced through a chemical process. By its nature methanol is more corrosive and provides 35% less energy then E85 so you have to burn 35% more of it to make comparable power. E85 cost the same or less then regular unleaded gasoline, methanol cost $4.00 - $5.00 a gallon. Q: What type of performance can I expect from making the switch to E85? A: It has been our experience that E85 with its 105 octane rating and high tolerance to detonation is superior to premium pump gas and equal to and in most cases better than 110 octane race gas. We picked up a tenth of a second and 2 to 3 miles per hour in the eighth mile after switching to E85 from 110 race gas and our engine runs 20 degrees cooler. Q: Don’t I have to replace all the “rubber” in my fuel system so it want be eaten up by the alcohol in E85? A: NO!!! We started out on this journey with a complete gasoline system. We upped the flow 30% to compensate for the lower heat energy output of ethanol and left everything else the same just to see the effects. We switched to E85 at the end of the 2006 racing season and to date we have found zero deterioration or corrosion anywhere in our fuel system. We leave it in the system all the time. We don’t drain anything between races or use any type of fuel lube. Q: How much compression can I run with E85 fuel just the way it comes out of the pump at my local station? A: This is one question I don't have a concrete answer for. We are running it in engines up to 14.5:1 naturally aspirated and some fairly high boost forced induction applications with great results. I have seen charts that draw the line at 16:1 but there again I just don’t have the data yet of a failure directly due to the compression limit of pump grade E85 being reached. Q: Where can I find E85 in this area? A: You can find E85 in any area by logging onto www.e85fuel.com and just click on your state for a list of stations that carry it. 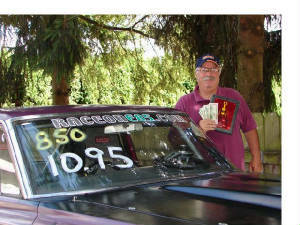 RaceonE85.com is racing through the recession with stimulus packages for your race car and your wallet. 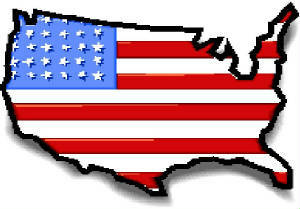 Convert today and save on the high price and ozone damaging pollutants that come from burning leaded racing gasoline. This is our chance as racers to do something that reduces our racing costs without compromising performance and benefits the future generations of racers and non racers alike by doing our part for the environment. Who knew going "green" could be this fun!!! Race on E85 is currently converting 4150 and 4500 Holley style carburetors to run on E85. Just send us your carburetor and we will convert and test it for you. We use all high quality, race proven parts that will have you racing on E85 with minimal test and tune time. Each conversion is custom tailored to your specifications to provide the best results possible right out of the box! A FREE E85 ethanol content fuel tester is included with every conversion. Prices start at only $395/4150 and $435/4500. Please email me, Justus Daniel at d3justus@gmail.com or call 704-560-0044 for details. We also have complete all out racing and street/strip carburetors built and ready to go. Technical assistance and trouble shooting is always free to our customers. We now sell an E85 Ethanol Content Tester Fuel for only $15 plus shipping. Current payment options are: Check/Money Order through the mail or by clicking here for a link to PayPal to use your credit/debt card. 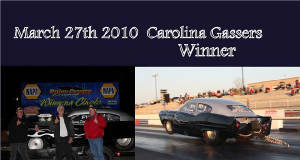 Congratulations Justus Daniel on your win at the first Carolina Gassers race of 2010. Congratulations Dave Sattem on winning your Super Pro 2010, 2011 and 2012 track CHAMPIONSHIPS and earning the 2011 KING OF TRACK title! 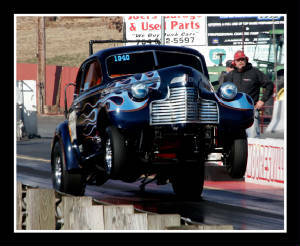 This is Tommy Lumley in his "Old Skool Outlaw" - 1940 Chevy. Grand Championship. GREAT job Tommy and good luck in 2011. This is Mike Pilsner from Raton,NM. His truck is the one on the left. He runs a 300 six cylinder with a 650 carb built by Justus Daniel at RaceonE85. The thing runs so good that he has to spot all the other trucks. The one in the right lane is a big block. It got to leave first, but look at how Mike blows by him. E85 at work. All I can say is WOW! I am an 8 time track points champion, 3 time VP Fuels Race of Champions Qualifier, National Dragster Challenge Wally Winner, and this years Ohio Crankshaft No Box Nationals Winner. I decided with the price of gas I needed a more economical way to go racing and save a little money, I researched E85 and came across the raceone85.com website. There are lots of websites that offer some good information but for some reason these guys just sounded like they knew what they were talking about. I decided to shoot Heath an email and he talked his way through the conversation like he has really tested this stuff, any question I asked he had an answer for. He asked me for my phone number and we had about an hour long conversation, and it was then that I knew I would give it a shot. Last weekend was my first time out with the E85 and again all I can say is WOW! Friday night I entered the Pro and Super Pro classes at a local track hoping to get enough passes in to get the car tuned right. The car ran 7.50’s in the 1/8th mile before converting, here is the first 6 passes I made on the E85, Off the trailer the car went 7.395, 2nd round 7.397, 3rd round 7.399, 4th round 7.391, 5th round 7.395, 6th round 7.399. I went on to win both classes that night. This stuff is amazing when you get it tuned right! It is an honor for me to add RaceonE85.com as one of my sponsors. Thanks Heath!! Just a note (and pic.) to let you and Joe know that the Dominator E-85 kit performed perfectly. The only change I made was to jet up one size square to 98's. I put it on my 64 Dodge (full exhaust system with cut-outs), and went last Saturday, 7-19-08, to Woodburn Dragstrip (Oregon) for the VP Racing Fuel Series to try out the E-85 modified carb. The results were incredible. From fastest to slowest 1/4 mile run, the car varied only .04 when most others were off by .1 or more in the heat of the day. The weather was 55-60 deg. in the morning and 85-90 in the afternoon. The 'Tuna Boat' was the picture of consistancy and beat the best in Pro Bracket. This was the 2nd time to the drag strip this year for the car and the 1st time on E-85, so we were quite pleased with the results. The tech inspector said he had not heard of any other cars running on E-85 before today. 7 rounds later they gave me a 1st Place Pro Bracket wall hanger and $240 cash. YOU GUYS ROCK! This first time out on E-85, the car was equal to race gas with times in the 10.90's @ 122 mph. I'm betting I can get quicker with some minor adjustments. The throttle response is what I noticed the most. It was instant! Great performance @ 1/3 the cost of race gas, $3.59 per gallon at the Shell Truck Stop on I-5. ..Bruce ~ Wallace. In a world of compromise, some don't. For the first time ever we bolted a carb on right out off the box and ran perfect!!!! 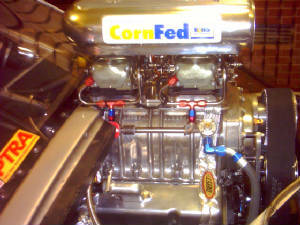 This was a raceonE85.com built 1050 cfm E85 carb tuned by them before delivery. I cant wait to get to the track to see what this thing will do. I think the record holding Performance Street car may have a few more ponies for 2009. The series changed the rules for 2010 to race gas only, outlawing E85 as a fuel for this class. Click here to see video of this conversion making passes. 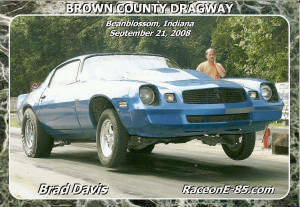 Ladies and gentleman I am proud to introduce you to the Brown County Dragway 2008 and 2009 Sportsman Bracket Points Champion for 2008 - Brad Davis. Brad is a dedicated racer that was brave enough to try something new last year after the half way point of the season while locked in a favorable position in points to become the track champion at Brown County Dragway in Indiana. That something new was to switch the fuel he raced on to E85. Brad called me up and we talked a little about his combinations. He bought a conversion kit and some E85 from a local station and headed to the track not knowing exactly what would transpire. After some minor tuning the wins started rolling in. Make no mistake about it Brad is an accomplished racer in his own right but now he had a car he could count on to run the number time and time again. All Brad had to worry about now was cutting the light which he had already mastered. I would get updates from Brad each week and each week he would tell me how he would just go up there and do his job because he knew the car would do it's job. I am very proud to say Brad Davis was running a RaceonE85.com conversion kit to close out his championship seasons and even prouder to call Brad a new friend. GREAT JOB Brad and good luck defending your back to back titles in 2010. Race on E85 will be behind you every step of the way. The weather was good today so we were able to get the track manger lets us have a couple of hours on the track today while they were doing some work in the pit area, my timing controller was my missing issue. I made a few passes with the meth carb to set some base lines running 6.89, 6.90, 6.89. Put the 750 on drained the cell and put in the E85 went 6.871, 6.872, 6.871 and a 6.860. I noticed a big difference in my 60 foot times seems to be the biggest time difference. My sixty foot on the meth was 1.483, 1.501, and 1.47 when I changed to the E85 1.433, 1.444, 1.440, 1.399 and I gained 4 MPH down track not to mention I was just getting against my top end chip when I crossed the stripe. I will probably take the 4.88 out and put in the 4.56. I haven't changed the plugs and did not change the timing, did not have to time to try any of those changes. One of the math wizards of the group did some figuring and we put 86 jets in it, engine temps were running where you suggested. I believe there is room for improvement yet. When I get all my meth run out I will go full time on the E85 and I do think that the others will follow in do time. Once again thanks for your site and the input. I printed off a poster and posted at the tower about you guys. Ready to make your own ethanol? Check this out. Find race fuel near including nitrous and E85. Click here to find out were to buy E85 near you. E85Forum.com - This is the place to go to talk E85. drivingethanol.org - This great reference site is all about ethanol and may answer a few of your question. Groove Technology - You have to see this. It could change the world as we know it. Special thanks to Gerald Baker for bringing this to our attention. Ethanol from Algae? Check this out and you decide. Innovate Motorsports - AWESOME site, their Tuner Resources section has some very valuable information. 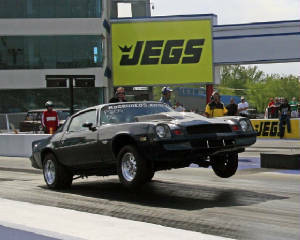 Check out Bruce's carbureted blow through supercharged E85 Thunder Bird! Can you run your non flex fuel vehicle on E85? Watch this and you decide. One option to convert EFI vehicles to flex fuel. Looking for t-shirts and other apparel? Check this site out. For really great event photos check out New Day Photography. E85 makes over 900 horsepower in Super Comp trim. 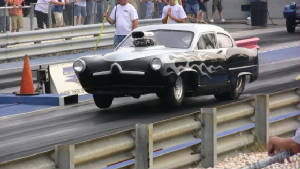 Daniel Drag Racing and RaceonE85.com in Action at Rockingham Dragway. This is Bracket Racing blog. 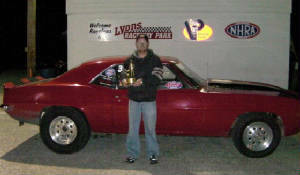 Spotlight on Nick Shephard, RaceonE85.com customer and WINNER! Disclaimer: All the information on this site (not to include the links that take you to a different web site) is based on our own experience for your review. We are not responsible for your interpretation or outcome from the use of any of the information provided.